If you are a frequent visitor to USGolfTV you may have come across my last article where I shared my experience taking Dr. Kwon’s Golf Instructor Biomechanics Level 1 class. The focus of the article was to help my fellow golfers realize that in many ways previous golf instruction concepts were based on personal opinions and rarely did those opinions have any scientific data to validate the message. 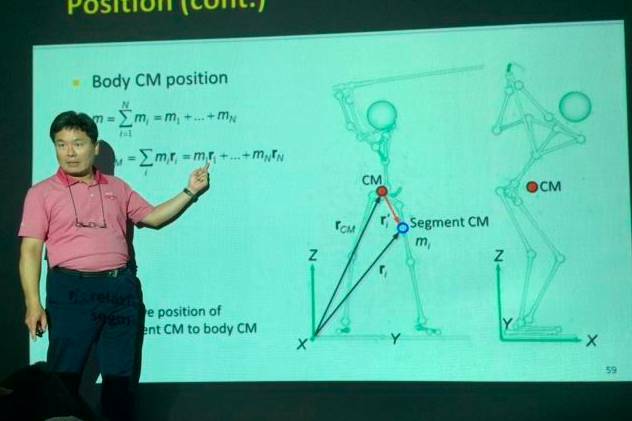 In this article, I will be taking a look at three concepts from Dr. Kwon’s program which either disproved previous teaching philosophies or simply gave a clear scientific answer to what is actually taking place in the golf swing. Note: These are just three concepts that hit home with me on a personal level. However, there were literally hundreds of concepts discussed that may have impacted other attendees and if asked, their list may be completely different. Also, please note that this is my personal interpretation of the concepts and how they relate to the golf swing. By no means do I claim to be an expert in biomechanics and some of the following content may not be written in perfect scientific context. If you want a more thorough understanding of the information I strongly suggest you consider taking Dr. Kwon’s course. In golf terms, the moment arm is defined as the difference between the Center of Mass (COM) and the Point of Interest (POI) or what I would refer to as the Center of Pressure (COP). Now this may sound confusing and highly technical at first, but stay with me and I promise it will be worth the effort. Recalling your high school physics class you will remember that COM is basically the balance point of the body. This COM can either be inside the body or outside the body depending on the body’s orientation at any given time. In addition, the COM will move from locations as the body is in motion. The COP is basically the point at which the body is producing maximum force into the ground. Now, during the golf swing both the COP and COM are in constant movement and the goal is to create some degree of separation between the two. This difference is what is referred to as the moment arm. Basically this– the more pressure you put into the lead foot in the downstroke while keeping your COM behind the ball, the more speed you will create. If you want to hit the ball further, your goal should be to have pressure forward at impact while your COM (bodies balance point) is behind the ball. If you can make this happen your moment arm will increase and your clubhead speed will follow. The ground is a great asset when it comes to building a motion that requires speed and consistency. The term we use to describe the relationship between the body and the ground is termed Ground Force Reaction or GFR. So lets go back to that high school physics class again and recall a few concepts. We know that when there is force pushed into the ground, the ground will push back at an equal force in the opposite direction. Think of jumping off the ground, in order to jump up you first must apply force down. Now in regards to the golf swing here is a simple example: if I apply pressure down and out (away from the target) into my trail foot, the ground will push back and move me towards the lead foot/target. This simple movement of applying force down and away in the trail foot helps create the needed force to then move my body and club forward through the strike. 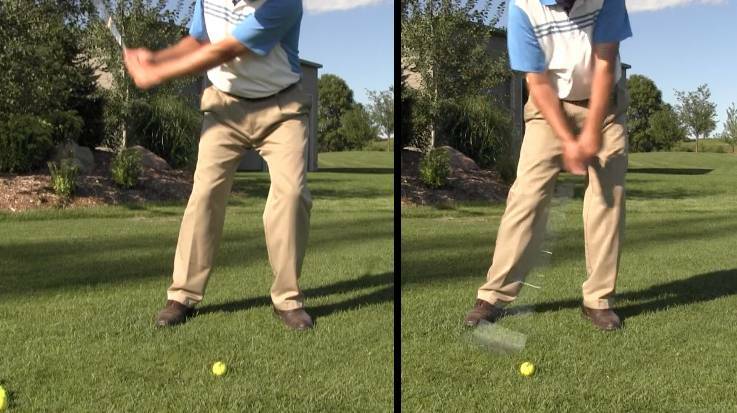 This is just one example of the many Ground Force Reactions that are taking place in the golf swing. If your body doesn’t utilize the ground properly you will never maximize your power output or your ability to deliver the club in an efficient and consistent manner. Spend time with someone who understands Ground Force Reaction and how it applies to the golf swing and you may just find your hidden untapped power. If you have followed golf instruction at all over the last 20 years you have come across information suggesting that in order to create more clubhead speed, you should reduce your hip turn while trying to increase your shoulder turn. This separation between the amount of hip turn and shoulder turn has been commonly referred to as the “X” factor. The truth is, that in order to create clubhead speed you need to use the ground (GFR) properly. The best way to do this is to get the Center of Mass (COM) moving slightly away from the target early in the backstroke. This is only possible if the hips are allowed to turn or in golf instruction terms release/rotate. Once the hips have released the COM will move into the trail leg, which is a key component to create power. When the COM is into the trail leg, a good push from the trail leg into the ground will slow down the backstroke and give the golfer the ability to push towards the target creating the transition to the downstroke. This push towards the target also creates the separation between the COM and COP or in other words creates a nice long moment arm. Don’t be afraid to let your hips rotate or turn in the backstroke. Take a look at some of the all time great swings in the history of the game. Notice what they do and how they use the ground. What will you see? A swing with a hip that is turning freely and a swing that is powerful and consistent. The golf instruction industry is on the verge of some major changes that will be good for the weekend golfer. Science based information is quickly becoming readily available and those instructors who are truly interested in providing the best will embrace this change. I am grateful to have spent a few days learning from Dr. Kwon and will certainly be one instructor who welcomes this new insight into the game of golf. Are you willing to discuss these three Kwon-derived concepts with me via a Skype video communication? My golf website contains the most detailed analysis of golf swing biomechanics/mechanics on the web.